Mitred Conures (Aratinga mitrata) - also known as Red-headed Conures, or Mitred Parakeets - are the second largest of the conure species. Mitreds are endemic to the Andes from north-central Peru, south through Bolivia, to north-western Argentina. Introduced populations exist in California, Florida and Hawaii. The Mitred Conure is a relatively long-tailed species with a total length of 13 to 15 inches (34 to 38 cm). Their average weight is about 7 oz or 200 grams. However, they may range in weight from 6.3-8.8 oz (180-250 grams). They are amongst the most beautiful conures. Adults are mainly green with varying amounts of red to the face and thighs. They have relatively conspicuous bare white eye-rings and heavy, pale bone-colored bills. 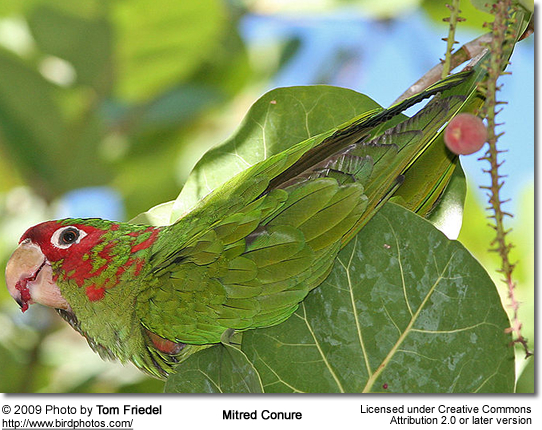 Unlike its relatives, the Red-masked, White-eyed and Cuban conures - adult mitred conures at most show one or two red feathers at the bend of the wing. Mitred conures may have red feathers scattered variably on hindneck, mantle, throat and thighs. Immature birds show little or no red to the plumage. Mitred Conures can take up to ten years to develop their full red-headed coloration, hence the drastic difference between individuals. Even with adult, fully-colored birds, there is a great variance in the amount of red they end up with. The Mitred Conures are popular pets as people enjoy their clowny and inquisitive disposition, in addition to appreciating their excellent talking ability. However, they can be nippy at times (as is the case with most conures) and they tend to be noisy, also a trait shared with the other conure species. These personality traits make them unsuitable for inexperienced owners who are looking for an easy pet. Mitreds are typically cooperative breeders. One of the challenges might be to find a nestbox they will accept. If this turns out to be a problem, offering a offering a choice of sizes and types of logs or nest-boxes - placed in various locations within the aviary - will allow the parent birds to identify their preferred nest box. Once a pair has chosen a specific nest-box/log keep that one for their exclusive use. At this point, any spare nest boxes can removed, cleaned and used elsewhere. Found in most of its range.Forecrown, lores and extensive mottling to face red. Found in the Cusco Region of Peru at higher altitudes than the nominate.Red virtually restricted to forecrown and lores, with little or no red mottling to face. 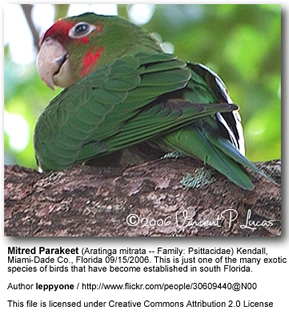 Mitred Conure, A. m. mitrata (nominate) - described above. From the Peruvian region of Ayacucho, south through Bolivia, to the Salta Province in Argentina.Forecrown, lores and extensive mottling to face (mainly around eyes, though not forming complete eye-ring) red. Thighs red. Found in the Peruvian regions of Amazonas, Cajamarca, Huánuco and Junín.Red of head virtually restricted to forecrown and lores, with little or no red mottling to face. Thighs red. Found in the Argentinian provinces of Tucumán and Córdoba, and probably also in Catamarca and La Rioja. The introduced Californian population likely belongs to this subspecies. Forecrown and extensive mottling throughout face red. Mottling forms a complete eye-ring, and often also with a few random red specks to neck and chest. Thighs red. Confirmed for the Peruvian regions of Huancavelica and Cusco, and the Bolivian department of Cochabamba. Red only to forecrown and lores, with few red feathers in the face. Thighs green. Endemic to Peru in the regions of Amazonas, Ayacucho and Cuzco, and in central Peru in the Carpish mountains and adjacent ridge south of the upper Huallaga River. Relatively large red forecrown patch, but no red to face or lores. Thighs green.